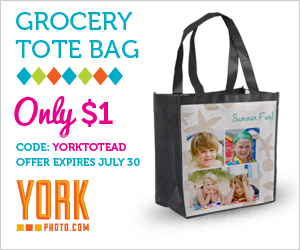 Make sure you enter the code YORKTOTEAD at check-out to get this deal. This bags are normally priced at $8.99 each! When you’re done creating your back, make sure you upload your photos to take advantage of the 40 free photo prints, too! You will have to pay a shipping and handling fee of $3.99, but that’s still a great deal for all of this!